FROM BOX TO LOCKED IN UNDER 1 HOUR! Designed for stability, the D2-Series laser system, with integrated spectroscopy modules, will be the easiest part of your experiments. A complete turn-key laser system, you get everything you need to go from box to locked in under 1 hour. Leave the lasers to us, so you can focus on your science. 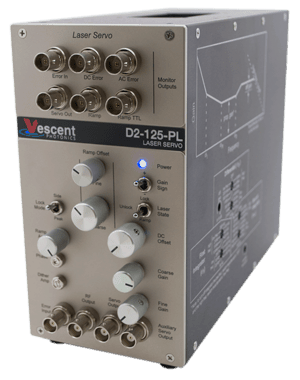 The D2-Series laser system is a complete turn-key solution that will be the easiest part of your experiments. Monolithic laser designs provide robust performance with piezo-less, non-mechanical tuning. Our Libbrecht-Hall current source and laser servo enable easy locking to atomic hyperfine transitions and cavities. 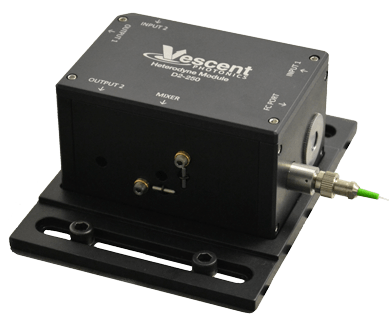 The D2-Series laser system can be ordered with either a D2-100 DBR laser, providing up to 40GHz mode-hop-free tuning, or a D2-100 CECL, providing <100kHz fast line width. Other modules to increase flexibility include: optical heterodyne modules, frequency offset locking modules, non-mechanical shuttering modules, and fiber coupling modules. 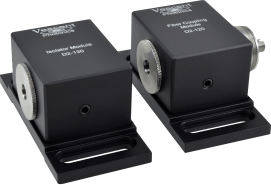 D2-100-DBR Laser Module: With the grating located directly on the semiconductor chip, the DBR laser module provides the most robust performance and longest mode-hop-free tuning range. Include laser diode, collimation and circularization optics, optical isolator, and two stages of temperature control. 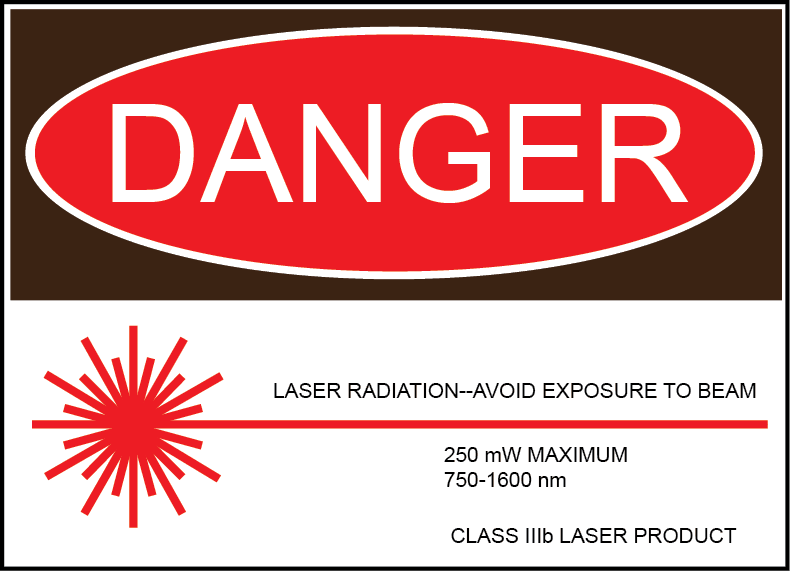 DBR: Distributed Bragg reflector laser diodes. 100 mW version available at 780 nm. 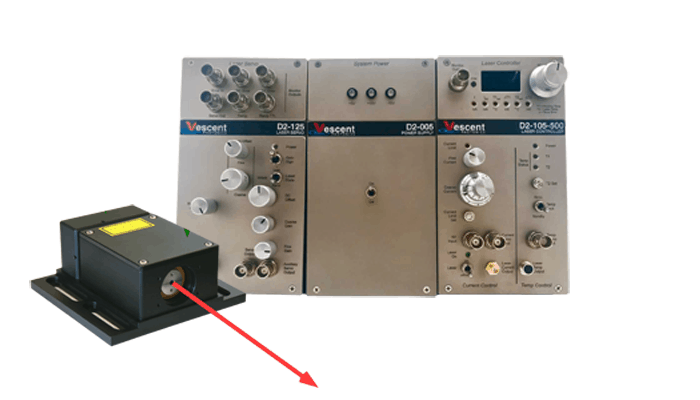 D2-210 Spectroscopy Module: Contains a saturated-absorption spectrometer and a 5 MHz, shot-noise-limited photo-detection circuit. Temperature control of the vapor cell and laser power normalization minimizes lock point drift. Now supports Potassium, Rubidium, or Cesium! 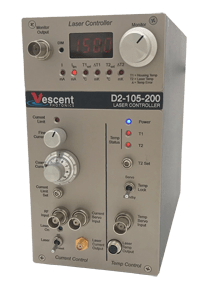 D2-105 Laser Controller: Based on an ultra-low-noise design (Libbrecht and Hall, ‘93) with <100 nA rms current noise (below 1 MHz), 1 microA/°C temperature stability, and > 10 MHz current modulation servo input. Contains two temperature controllers to give 1 mK temperature stability. D2-125 Laser Servo: A fast transfer function tailored to the diode injection current ensures the tightest lock. Double integrators give high DC gain and stability. Can be set to side lock mode or peak lock mode. 4 MHz FM sideband modulation in peak lock mode preserves system bandwidth and enables the laser servo to be used for Pound-Drever-Hall locking to optical cavities. 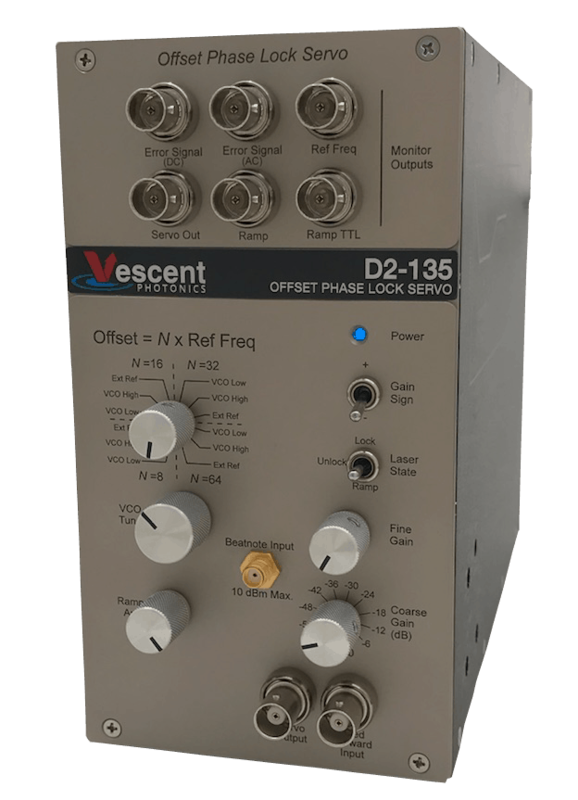 D2-135, Offset Phase Lock Servo: The OPLS provides offset phase locks up to 9.8 GHz controlled by computer or front panel. The heterodyne module accepts beams from two lasers, overlaps them, and then provides the overlapped beam to an optical fiber. This optical fiber connects directly with the OPLS. D2-005 Power Supply: An external, low-noise linear power supply keeps 60 Hz and harmonics off your signals. This power supply may be used to drive up to four electronics modules. D2-120 Fiber Coupling Module and D2-130 Isolator Module: Fiber coupling module contains a 35 dB isolator, 1/2-waveplate, and FiberPort for coupling into fiber. Isolator module is without the FiberPort and is used prior to the PICOS module. D2-250, Heterodyne Module: Designed to overlap two laser beams to produce an optical heterodyne beat note. Fiber-coupled output delivers beat note to the D2-135 Offset Phase Lock Servo or other heterodyne detection devices. 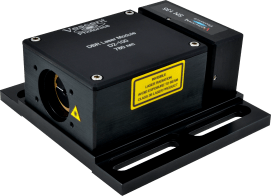 ICE (Integrated Control Electronics): Compact laser control with a digital human interface and low-noise, high-speed analog control over up to four laser systems.